It seems to be a good move by government to merge public sector banks as they will now target efficiency and governance rather than competition. The sector can now improve on financials. So true is the statement that ultimately the new bank will be a public sector undertaking that will function in the same old manner with little accountability and impunity for bank officials. Banking space has its drawbacks and weaknesses. At least now we have someone who has thought of rectifying weaknesses by way of consolidation and this will prove to be profitable in the long run. 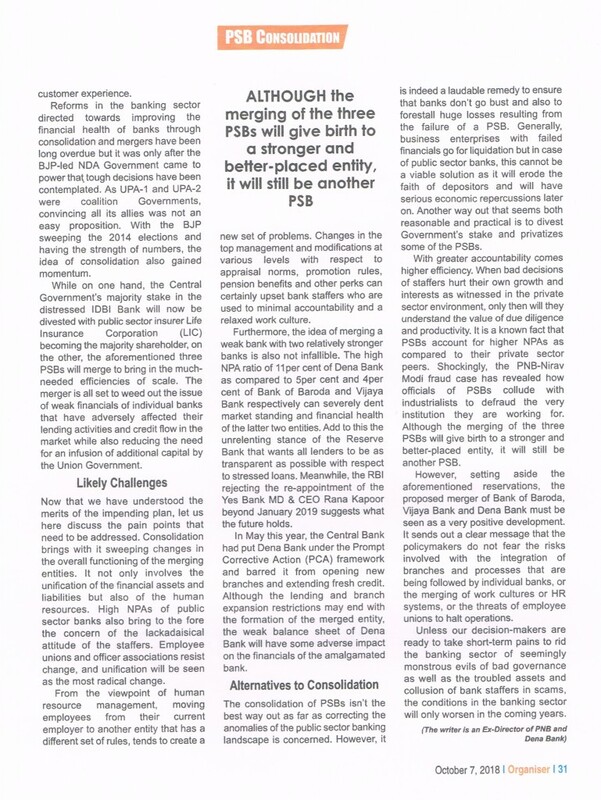 The biggest challenge is to merge employees of three banks in one bank. They have different mindsets and work culture and the move of merging can backfire if this aspect is not taken care of. Dena Bank has the weakest financial numbers and it will pose a problem for other two banks that are functioning well in their regions. The weak bank can prove to be a drag in this exercise. Most crucial part is to rid banks of bad governance and inefficiency of employees. Unless a sense of duty is inculcated in them there will be no benefit from merging public sector banks of India. Customers of all three banks will be the ones who are set to reap the benefits of merger. At least now they can use their debit cards on larger number ATMs of any of the bank. With IDBI out of government hand, it will be problematic for employees to deal with new management whose sole focus will be on profitability and reducing expenses. What about privatising banks? Having fewer banks is good but this cannot be an alternative to privatisation. The government can raise much money by divesting its stake in PSBs and this must be done. 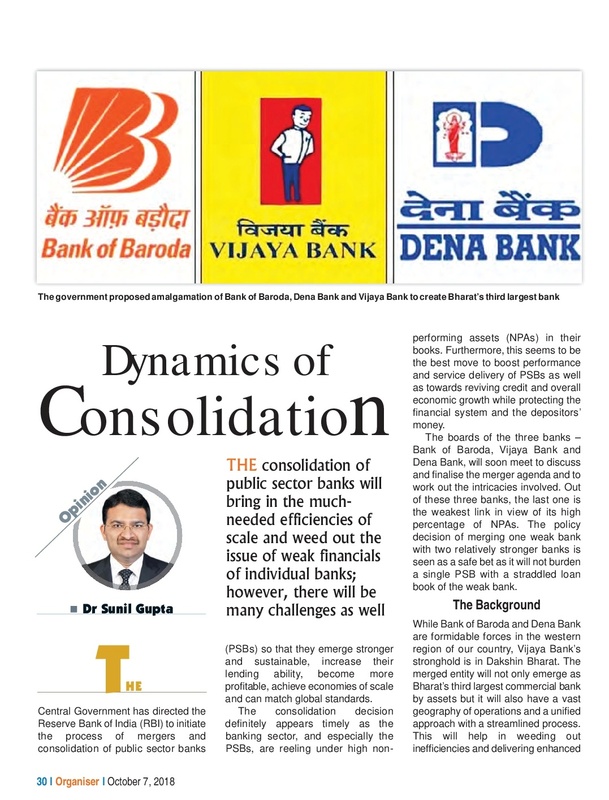 Many analysts and experts have given mixed reaction to merging of Dena Bank, BoB and Vijaya Bank. With the passage of time we can claim if this is the best way of improving India’s public banks. The next time I read a blog, I hope that it does not fail me as much as this one. After all, I know it was my choice to read, nonetheless I actually thought you would probably have something helpful to talk about. All I hear is a bunch of whining about something that you could fix if you weren?t too busy seeking attention. I blog often and I genuinely appreciate your content. ?This article has really peaked my interest. Rarely do I come across a blog that is both educative and amusing, and without a doubt,?you?ve hit the nail on the head. I need to to thank you for this wonderful read.. I certainly loved every little bit of it. I have got you book-marked to look at new stuff you post?